The Capability Dictionary is a set of online ‘cards’ that describe a range of capabilities which contribute to an efficient, effective and productive public sector workforce. It is an interactive tool which helps to get you started in thinking and talking about the capabilities that are needed for success in public sector roles, including personal qualities, mindsets, professional knowledge, contextual knowledge and skills. when preparing for workplace or job change. The dictionary works like a card game or a shopping website. You sort, select, review, and then take away any content you think will be useful. You can save selected capabilities to a shortlist, which can be emailed or printed. This resource is built for optimum performance in Google Chrome, Mozilla Firefox, Safari, Internet Explorer 9, 10 and 11. Managers transform organisational vision into outcomes. To do this managers advise, lead, follow, connect, collaborate, act, persevere and deliver. The role of the Victorian public sector manager is rewarding, complex and challenging. In order to succeed in this role, managers need to develop and apply knowledge, skills and behaviours over and above the technical or professional expertise they may have. Developing management capabilities across the public sector is essential for an effective public sector. 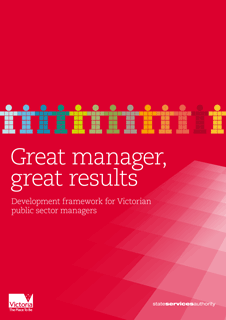 VPSC developed the Great Manager, Great Results suite of resources for those working in the Victorian public sector. It is also suited to individuals and organisations that design and deliver development activities for Victorian public sector managers. The VPS HR Capability Framework has been developed to provide a consistent understanding of the knowledge, skills and attributes required by human resources (HR) professionals in the Victorian Public Service (VPS). The framework is a good starting point to articulate the capability expectations for HR professionals within the VPS. As a general principle, work that could reasonably be conducted by public sector employees should not be given to external contractors. The Victorian Public Sector Commission (VPSC) works in partnership with development providers featuring a small number of whole-of-government leadership and development programs.